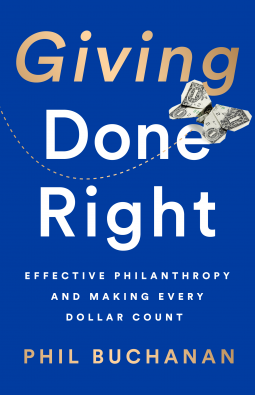 In Giving Done Right, Phil Buchanan, the president of the Center for Effective Philanthropy, arms donors with what it takes to do more good more quickly and to avoid predictable errors that lead too many astray. This crucial book will reveal the secrets and lessons learned from some of the biggest givers, busting commonly held myths and challenging the idea that "business thinking" holds the answer to effective philanthropy. And it offers the intellectual frameworks, data-driven insights, tools, and practical examples to allow readers to understand exactly what it takes to make a difference.